On its 70th anniversary Porsche is making some big moves to make sure the brand stays relevant, and profitable, for the next 70 years. One of them is the launch of a series of electric cars, beginning with the Mission E sedan, or what is now officially called the Porsche Taycan. The name is an homage to the brand’s 70-year history and mainly its famous crest as it means, roughly, “lively young horse.” It’s a reference to the leaping steed featured on Porsche’s crest since 1952. 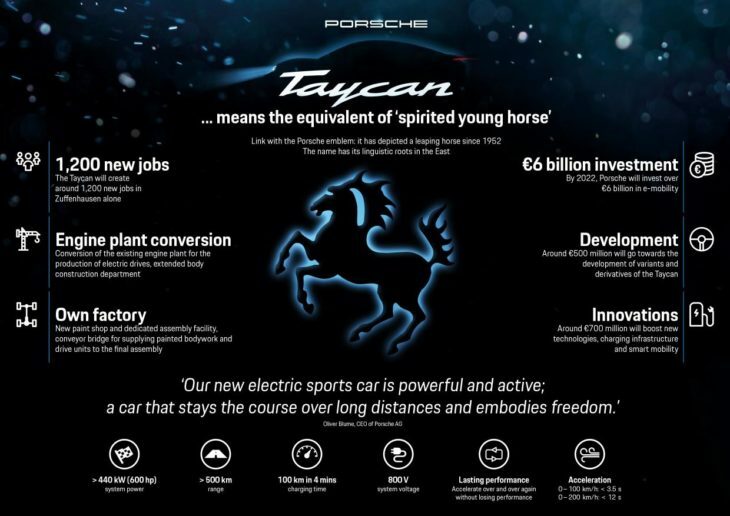 So Porsche Taycan becomes the first production electric car by the legendary German automaker, and by the looks of things it is going to render all the other efforts in this segment pointless because it is just so bloody good. Porsche Taycan features two permanently activated synchronous motors (PSM) with a total output of over 600 horsepower. So it has the power expected of a Porsche. In terms of performance, the Taycan sprints form 0 to 60 mph in 3.5 seconds, and passes (200 km/h) in less than twelve seconds. As for the range, the preliminary figure is 300 miles on a single charge, but we have to wait for the final figures as well as the charging time before we can take the torch from Tesla Model S and pass it to this car. The post Porsche Taycan Is the Official Name of the Mission E appeared first on Motorward.